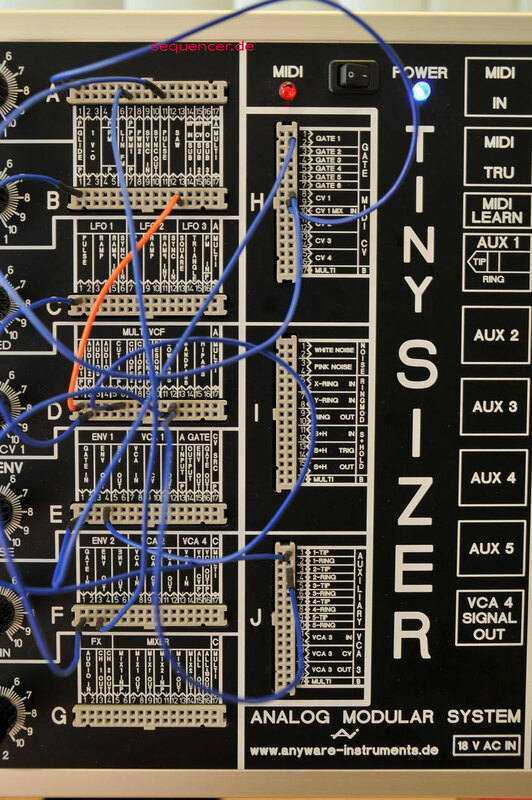 Announce new modular synth, the patch bay is smaller than you might expect. here’s the first info. ANYWARE Tinysizer built in 2010 – will be released very soon, this is the proto and this is the first announcement, you won’t find it elsewhere, but more to come soon. Find first audio (quick and dirty) in the SynthDB also..
: 31,7 cm width/breite, 24,5 hoch/height und 4,3 cm tief/depth. 3 Subs, the 3rd gets it’s signal from the 25% pulse of the second VCO. CV controls resonance as well! PW Waveform morph LFOs and VCOs!! 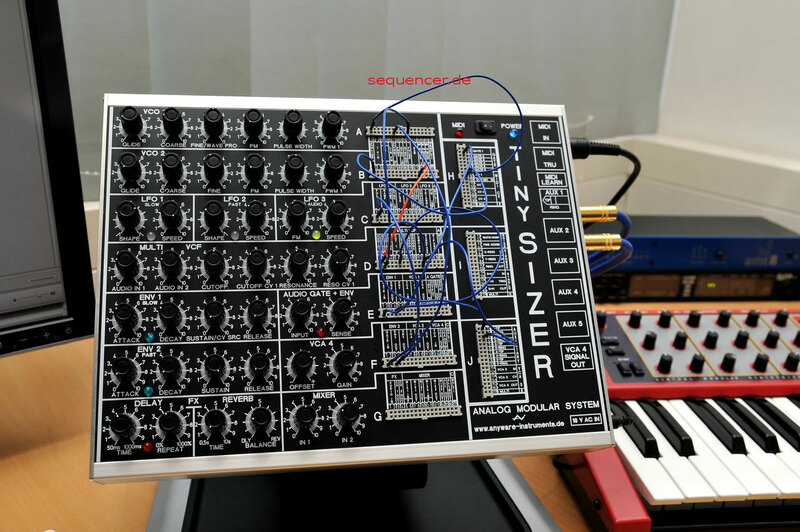 Multimode Filter 12dB/Oct – Oberheim Style all filters can be accessed. Der Tiny hat einen Wavefolder, der ist da. Frei patchbar, Justierbar mit Fine-Regler. erlaubt ein blenden von ansteig saw über tri zu abfallenden saw oder andere Dinge. 6te ist als audio-cv out/oder etwas anderes mit vca verbunden und hat einen monoausgang der aber auch den ring mit signal belegt. so hat man auch mit einem sterekopfhörer alle 2 kanäle da. eine cv-source hat er auch noch sie wird mit dem sustain env1 geregelt.die 5 aux buchsen sind stereo und über splittkabel aktiv es kann ja ring und tip seperat gepatched werden. Preis wird 1600€ sein. 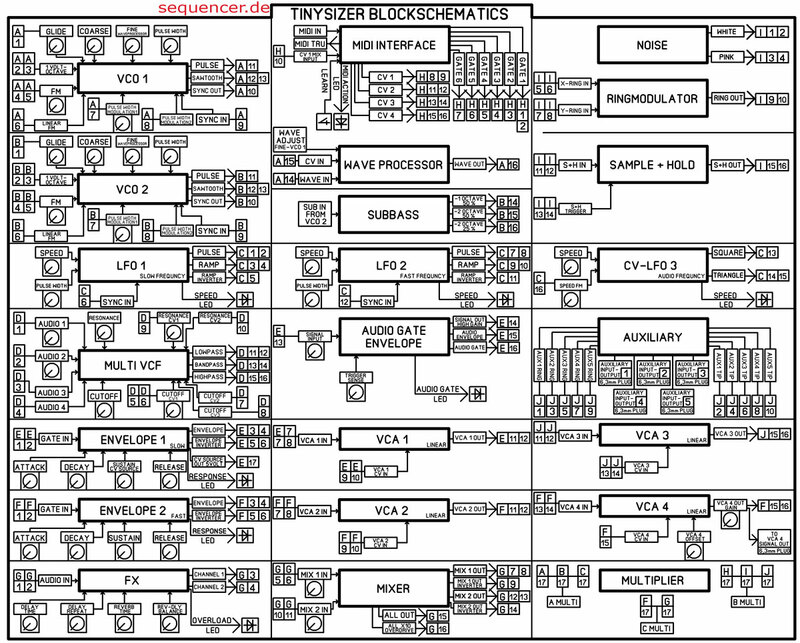 Ah I will sooner or later implement a real audio player on the synthDB, but for now you need to download audio / video..
via Anyware Tinysizer Modular Synthesizer – (C) synth DB. Weiter Musikmesse Frankfurt – Music Fair 24.-27.3.2010 preparing..
6 OSCs rom sample 2-3MB, 6 LFOs, 18 EGs, 6 FILTERs (3pole), advanced sequencer, no arpeggiator more..